The Airbus A319 flight service will fly from Heathrow’s Terminal 4 daily at 9.55pm, while the service from Doha to Heathrow will depart daily at 2.50pm. 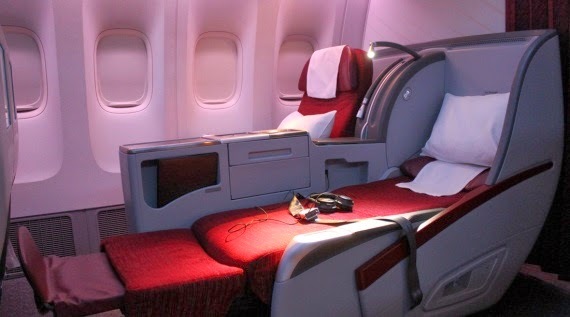 As the first all-business class service to launch from the Middle East, Qatar Airways has fitted its Airbus A319 with 40 Business Class seats, which recline fully into flat beds, with a single aisle separating 2 seats on either side. Customers will be able to contact associates in flight via SMS as GSM and GPRS connectivity, while a selection of over 900 films, tv shows, games and music channels will also be at their fingertips, via the airline’s Oryx entertainment system. Perks for this service start at the airport, where customers can enjoy the exclusivity of Doha’s Premium Terminal or of Heathrow’s new Qatar Airways lounge. Currently operating five other daily flights from London Heathrow, UK travellers will enjoy the privacy and luxury of Qatar’s five-star hospitality on any of its flights. Crowned 2013’s World’s Best Business Class Airline, Qatar Airways also earned the 2011 and 2012 Airline of the Year Award at the prestigious Skytrax Airline Awards. The recent 2014 UK Business Travel Awards also crowned Qatar Airways as the ‘Business Airline of the Year’ and the ‘Best Long-Haul Airline’. Operating for 17 years, Qatar flies to 134 destinations, with 129 aircraft. The rate for this premium service has yet to be confirmed by Qatar Airways; however, the first round-trip flight, leaving Heathrow May 15 and returning from Doha on May 22, is priced at £4,325.